Registration is now closed. Thanks for your support! You represent and warrant to Bharat Group including all its subsidiaries and affiliated entities (“Bharat Group”) that you have the authority to register and/or act as agent to complete the registration of the Events on behalf of yourself and/or any party(s) you are registering (“Registered Parties”) through our online registration portal, runforcherish.bharattea.com.my. Your acts for and on behalf of the Registered Parties shall be binding upon them as if they have done it themselves. You further warrant that you have the full authority to utilize the credit/debit card or online bank transfer to which registration fees and other transaction fees (if any) are to be charged. You also hereby indemnify Bharat Group of any and all claims of loss of damage related to the credit card and debit card transactions done over this registration portal. 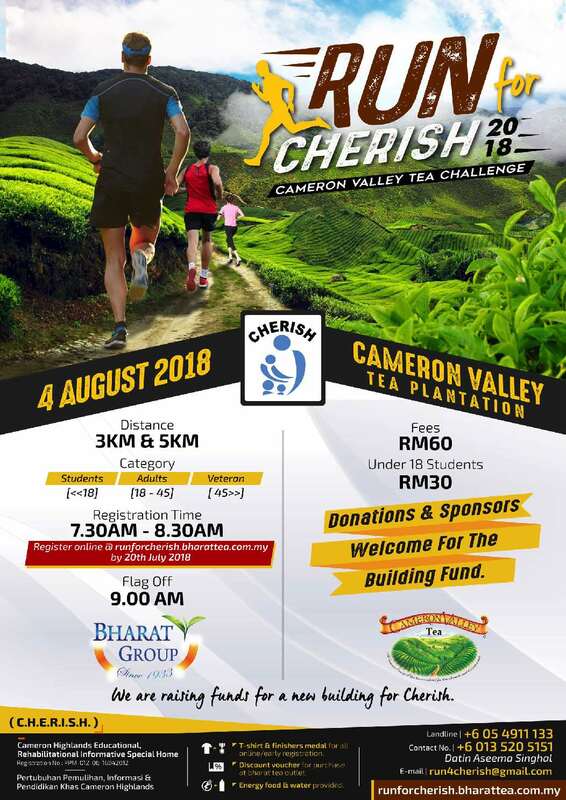 All transactions through runforcherish.bharattea.com.my will be in Ringgit Malaysia (MYR or RM). For participants paying from overseas or using a non-Malaysian Bank, exchange rates conversion will apply (depending on individual banks). If you have any questions on the bank rates, please contact your local banks. The Personal Data of the Registered Parties shall be used by the Organiser and Bharat Group for the purposes of sending communication materials to the Registered Parties, including but not limited to, direct mailers, emails, Short Messaging Service and/or telephone calls. It is the responsibility of the Organizer to communicate its refund policy to the Registered Parties and to issue refunds to the Registered Parties via the Site or otherwise. If the Registered Parties desires to request a refund, the Registered Parties must request the refund from the Organizer. All communications or disputes regarding refunds are between the Organizer and the Registered Parties and Bharat Group will not be responsible or liable in any way for refunds, errors in issuing refunds, or lack of refunds in connection with the Services. All communications and disputes regarding chargebacks and refunds are between the Organizer and the Registered Parties and Bharat Group will not be responsible or liable in any way for chargebacks in connection with the Registered Parties' use of the Services. If you are the Registered Parties and you wish to request a refund in connection with an event listed on the Services, you should contact the applicable Organizer directly. The Registered Parties will need to contact Bharat Group at runforcherish@bharattea.com.my if they were to contact the Organizer for refund. The Registered Parties acknowledges that participation in the event will be physically demanding and warrants that he/she is in good physical conditionand have sufficient preparations and is able to safely participate in the Events. The Registered Parties are fully aware of the nature of the event and the associated medical and physical risks and hazards involved in participating in the Events, including the possibilities of serious physical trauma, injury or death. The Registered Parties consents to the use of his/her name, photographs taken and any appearance filmed or recorded by Bharat Group in broadcasts, newspapers, magazines, brochures, internet website, and other media for the purpose of advertising, publicity and otherwise in relation to the exploitation of the event. Registered Parties further agrees that he/she shall not claim or demand for any compensation or payment for such usage. The Registered Parties acknowledges that the Organizer of the Event has the right to alter, change, cancel and/or postpone any of these events as a result of circumstances that would direct effect or impact the event which is or beyond control. Bharat Group makes no warranty and assurance that the services in http://runforcherish.bharattea.com.my/portal will be uninterrupted, secure or error free. Howei also does not guarantee the accuracy or completeness of any information, or provided in connection to the Events or otherwise in the website. The Registered Parties agree that this Agreement and Waiver is governed and construed in accordance with the laws of Malaysia. The Registered Parties further agree that this Agreement and Waiver is intended to be as broad and inclusive as is permitted by law of Malaysia.